December 8. Would have been my fathers 75th birthday. 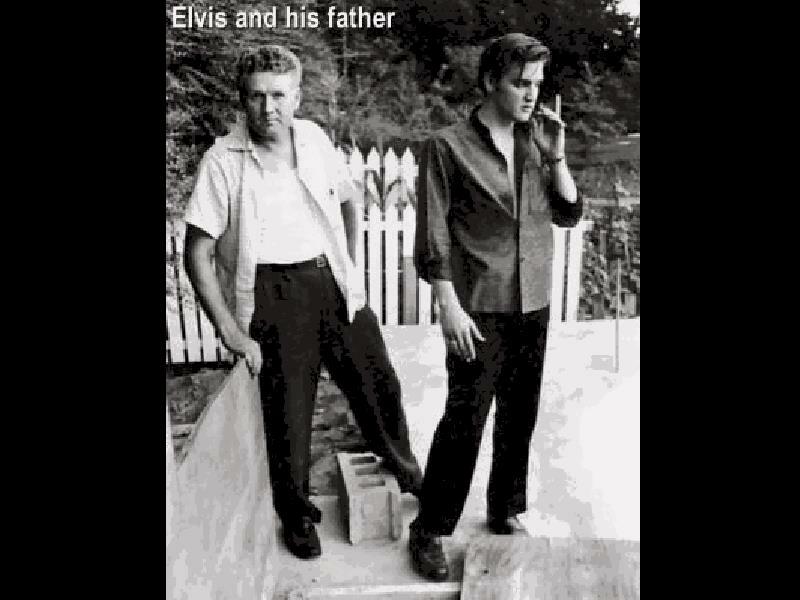 As I visit my sister in-law’s Facebook page I find this rare photo of Elvis Presley and his father. Mm… will pick an Elvis song for my dad today. A little less conversation, a little more action please. Time to rock ‘n roll! Get things moving. Let’s get groovy! And hey – if you would create your own video with One True Media – what would you do? In this asana the object is to imitate a corpse. Once life has departed, the body remains still and no movements are possible. By remaining motionless for some time and keeping the mind still while you are fully conscious, you learn to relax. This conscious invigorates and refreshes both body and mind. But it is much harder to keep the mind than the body still. Therefore this apparently easy posture is one of the most difficult to master. The following evening I attended an entrepreneurship event organized by TiE – The Global Network of Entrepreneurs in Silicon Valley. The title was “Wisdom From Past Entrepreneurs – The Dirty Little Secrets that No One Talks About” presented by the CEO Freedom Fighter Christine Comaford. Christine is a business accelerator referred by individuals such as Bill Clinton and Bill Gates. She has track record like few – check this video for a taste of her wisdom to help you as an entrepreneur avoid the mistakes that keep you overworked, underpaid, and feeling trapped by your business. As a former Buddhist monk (aside from software engineer, geisha trainee, entrepreneur and venture capitalist) one of her key tips at the end was “keep the mind still daily”. She recommended Eckhart Tolles latest books “Stillness Speaks”, and she reiterated what I have said before – it is so often in that stillness that you find a great idea or the solution you have been looking for. Next morning I receive an email from my leadership group where one individual shares along the same lines on a personal level: “Awareness is just that…staying without judgment, feeling without adding shoulds, and in the end, being able to look into my own eyes and see the joy and strength and beauty of the moment – awareness of the moment is the connection to the heart…. connection to the heart is connection to everything else that exists in the Universe. […] I have gained quite a swatch of grey hairs over the past year – and the peace I feel in my heart is allowing me to step into my role as an elder with courage and incredible enthusiasm. While I have lost what I thought was the love of my life, I have gained what I know to be the life of my love.” So beautifully put. It made me think of the introductory words of a book I had just come across: Enchanted Love, by Marianne Williamson. “Forget logic. Forget your head. Open your heart, and come with me.” Now I am curious what more it has to say. Dead man’s pose in reality – how attractive is that? Maybe more than you think. During my five years living in San Diego – nothing could beat kicking off the weekend with a 9am Saturday Nia class with Rocco Ragano at Eight Elements West. Outstanding Nia teacher and excellent dancer. Rounding it off with a Cafe Latte from Vahik’s Coffee brought down to Windansea Beach to breathe in the ocean breeze, watch the surfer pro’s and catch up on life with the girlfriends or myself. Unbeatable. Keep your eyes and ears open – Rocco will be visiting San Francisco to teach Nia this fall. I’ll let you know the details. Rocco posted the below youtube movie on his Facebook wall. Beautiful and very touching. It is quite an inspiration and great reminder of: What is really possible? Who sets the limits? Take a moment to watch it! In your situation right now – what is really important to you? What would you like to achieve or create? With a beginners mind, what do you commit to? You set the limit. Don’t let anyone else do it. Lift the bar! You can do it! Low fares in the air!!! SAS has sales on tickets to Scandinavia – if you have a little extra time for vacation before December 16 – do check it out! Just an example: San Francisco – Stockholm from $247 – THAT is hard to beat! I checked, and it is only one way… it is still a good price though. Pretty much half the normal cost. Click here to see the complete list of destinations and departure cities. Do you need inspiration? Go to www.visitsweden.com. Read the “Take a chance on Sweden” article in Times Online and start dreaming about the future ;). Go in December and experience the light in the darkness – Lucia Procession December 13! Just do it! go Go GO! Two years ago my acappella group Keeva went to Portland to sing at Chris’s, one of the members, wedding. The day after we were strolling around and enjoying the city. To avoid the rain we stepped into a bookstore – and there is this book starring at me: “This Time I Dance! Creating the work you love.” If you’re this successful doing work you don’t love, what could you do with work you do love? Move mountains. I know. I continued reading – “If you’re ready to make the journey into the life of living your dreams, Tama J. Kieves is the tour guide you’ve been looking for… Tama gives voice to the fearless spirit within each of us. If you want to wake up to your own passion, read this book. It will open your heart and guide you home.” Very nice – I recommend it! The author Tama J. Kieves is an honors graduate of Harvard Law School who left her practice with a large corporate firm to pursue a writing career and embolden others to live and breathe their most meaningful self-expression. Today there is the book, workshops, study groups etc – look it up on meetup.com, I’m sure you’ll find some. Or read the book and start one. Start dance to your own music, or just add the instrument that is missing, and trust the journey. If something like this would happen – then we know what to do. Break down, get up, and move on! Whatever situation you are in – keep dancing through life! I have received two sad news today. A student peer of mine got assassinated in Sweden in front of his two-year-old son. My friends grandpa passed away unexpectedly leaving his wife behind after 68 years together. In memory and honor of those, and sympathy and support for the ones left behind, I am sharing a poem that touched me at the memorial service in loving memory of my friend’s husband who also recently passed away. I am the soft star that shines at nigh. Take really good care of yourselves. Fine, Fair and Hot – that was the weather forecast in Croatia last week when I had the privilege to join the crew on Geja sailing. Thank you Andrew and Henkku for an awesome week together! The sailing adventure in the northern part of the Adriatic Sea was fine in every which way. Beautiful sceneries, excellent sailing, high quality crewmembers, and fine dining… on board. It’s such a pleasure to sail with someone who makes every meal to a feast – breakfast, lunch or dinner. Actually – not only when you sail. And I don’t think that attitude only relates to food. It is an attitude about life, to enjoy. I like. I guess I teamed in to add what I could as well. Ha! He could have been in an ad! Because that was exactly what the Swedish company Electrolux meant during their UK campaign in the 1960’s, right!? No?! Maybe this was a malapropism… Someone though who was full of puns and knew exactly what he was saying – or singing – was (still is) Robban Broberg with Båtlåt (Boat Song).